Some companies might take exception to your scribbling all over its catalog. But not Ikea. For a while now, British illustrator Sarah Horne has found the Ikea catalog to be an inspiring canvas on which to draw fantastical scenes—with mythical creatures all relaxing in minimalist Swedish homescapes. Well, Ikea saw the drawings—and loved them. And over the holidays they invited Horne to be an official children's illustrator in residence at its Wembley store. "As a child I was always doodling and dreaming up a never-ending number of fantastical dinner parties that featured fictional creatures from the pages of my favorite storybooks—imagining what it would be like to have dinner with a dragon or breakfast with Bigfoot," Horne says. "Although I'm all grown up, my mind runs riot with the fantastical meals I always wished I could be a part of, using pages from my favorite Ikea catalogue as a canvas to bring my mythical creations a little more into reality." Horne's pictures gave Ikea an idea. The company could use them to help reinforce the idea of the importance of family dinner times. 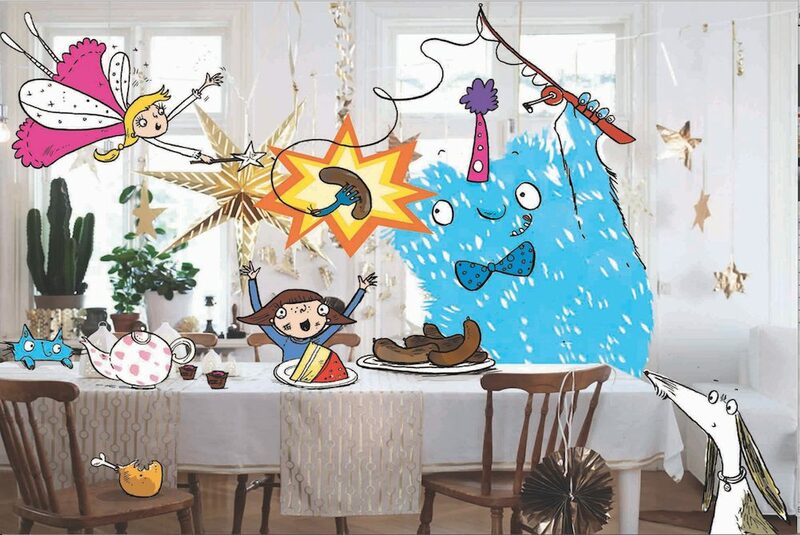 "We know how easy it is to get bogged down in the craziness of everyday life, so we hired our children's illustrator in residence to put the wonder back into dining together," says an Ikea rep. "At Ikea, we firmly believe that each and every mealtime is special in its own right, whether it's a midweek supper for your partner, breakfast with the kids, or pizza at home on a Friday night. It's all about spending quality time together and treasuring those moments as a family." Hear more from Horne below. Via PSFK.